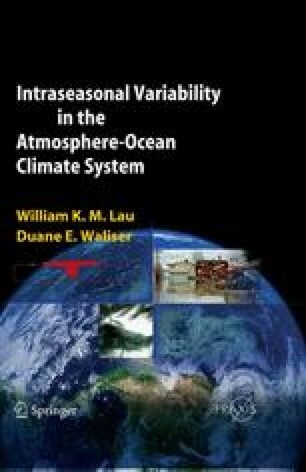 Air—sea interaction associated with tropical intraseasonal variability (ISV) and, particularly, the Madden—Julian Oscillation (MJO) is of interest for three reasons. First, variations of the air—sea fluxes of heat and moisture may be fundamental to mechanisms of tropical ISV. For instance, air—sea interaction may promote the slow eastward propagation of the MJO and its northward propagation in the Indian summer monsoon. Besides playing a critical role for the interplay between convection and dynamics, surface fluxes of heat, moisture, and momentum drive sea surface temperature (SST) perturbations that may feedback to the surface fluxes and ultimately to the atmospheric dynamics, thus, for instance, contributing to the growth of the MJO. Second, the episodic variations of surface momentum, heat, and freshwater fluxes driven by atmospheric ISV may play a role in the maintenance and low-frequency variability of the warm pool in the tropical Indian and Pacific Oceans. For example, the MJO induces transports in the equatorial west Pacific that act in the mean to remove about the same amount of heat from the warm pool as is provided by the mean surface heat flux (Ralph et al., 1997). From the opposite perspective of the ocean driving the atmosphere, interannual variations of SST in the warm pool may also drive interannual variations in MJO activity, which may bear on the ability to predict seasonal variations of MJO activity. Third, the MJO forces surface currents that drive SST variations at the eastern edge of the warm pool (e.g., Kessler et al., 1995). Kelvin waves are also efficiently excited by the MJO (e.g., Hendon et al., 1998), which radiate into the eastern Pacific where they can perturb the SST (e.g., Giese and Harrison, 1991; Zhang, 2001; McPhaden, 2002). These intraseasonal SST variations may lead to a rectified coupled-response, which plays a role in the evolution of the El Niño Southern Oscillation (ENSO) (e.g., Bergman et al, 2001; Zhang and Gottschalck, 2002).